Deluxe Reuben Sandwich Kits for sale. Buy online at Zingerman's Mail Order. Gourmet Gifts. Food Gifts. Our legendary reuben kits with extra food, extra swag, and loads of extra deli love. Choose Corned Beef, or Pastrami, or Turkey. We'll pack it up in our cartoon cardboard gift box with a whole lot of other stuff: Jewish Rye bread from Zingerman's Bakehouse, freshly sliced Emmentaler Swiss cheese, Zingerman’s potato chips, coleslaw, Sauerkraut, Russian dressing, garlicky pickles, Magic Brownie Bites, a nosher-sized Sour Cream Coffee Cake, a jar of Raye's mustard, plus sandwich baskets and Zingerman's liners, Zingerman's napkins, and a couple of tattoos (temporary, alas). With the extra ingredients, you can make a slew of your favorite Zingerman's Deli sandwiches and then finish the meal with a little sweet treat. Download our professional-grade instructions, which also come inside the box. "Their reubens are so good, I became that tedious person talking to my family about them in detail on the phone." "Zingerman's sandwiches are an 11 on a scale of 1 to 5." "Your Reuben Sandwich Kit absolutely floored my parents. Easily the best present I have ever gotten them. It made up for 37 years of me being an awful son. They cannot stop talking about how great it was." 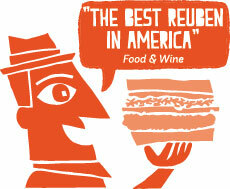 "Zingerman's...made Reuben-giving a sacred holiday tradition."